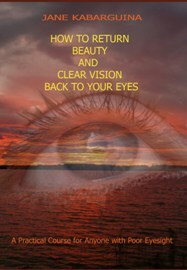 Eye Acupressure - improve eyesight, relieve eye pain. Let’s have a little break and boost some energy into your eye area. The best way will be the Shiatsu method which is also called Acupressure. ‘Shiatsu’ is Japanese for ‘pressuring by finger’. The force of massaging finger is applied to the same dots that are used by Acupuncture. The science of Acupressure goes back many centuries ago. There are different stories about how the method was born. One of them talks about a Chinese soldier that had a stiff shoulder which was very uncomfortable and painful. The doctor in the soldier’s village could not help the poor guy with anything. Then this soldier was called to the war and one day when he was fighting in the battle his leg was pierced by an enemy’s arrow. Our guy bended down to get the arrows tip out of his leg and suddenly noticed that constant pain in the shoulder was gone. I am not too sure if the enemy became an instant friend right away, but when our soldier came back home he told the doctor about his miraculous healing. That is just one of multiple stories that talk about the way how the method was born. The acupuncture is known and used in Japan, China and India from the Stone Age. There are ancient books found that have diagrams of the meridians and acupuncture points located along these meridians. The human body has different systems of circulation built in that either flow internally or socialize with the Universe. For example, the heart pushes blood through arteries and veins to different organs and muscles. We inhale air, use oxygen by our respiratory system, pass it on to our blood, brain, get back the carbon dioxide and pass it to the atmosphere. The meridians are pathways for the energy throughout the body. If there is something wrong with the organ or muscle they pass this information to the meridian responsible for that organ and the meridian is going to signal through certain points on the body. These spots will become painful crying for help. If their screams are noticed well in advance then the illness can be prevented before it is started to affect the body. By simply massaging these screaming dots or inserting the needle it is possible to restore the energy flow and therefore correct proper functioning of the corresponding organ or muscle. I am not suggesting using the needles, because there are too many conditions for their use, but we can simply follow a few shiatsu rules in order to perform a professional massage on ourselves. Use either tip of your middle finger or the knuckle of the same finger. If you use the tip of the finger, make sure that your nails do not cut the skin of the massaged area. Do not bend the finger. Use spiral or circular movements. Do not move your finger (or knuckle) back and force. The first Eye Acupressure Point is located at both sides of the bridge of your nose. Find the spot that reacts with the pain on the finger pressure. Use middle finger tips to press this point. The next dot is located right underneath the pupils. Work on it for a minute, using different pressures of your massaging fingers. Then the next points will be your temples. Again, you have to remember these dots are either painful or feel like there is a hole in the bone (Do not use any other objects for pressure on these dots except your own fingers!) And the last point of pressure (and usually the most painful one) is located in the middle of the eyebrow. During this little massage session you will find out that your eyesight becomes much better, especially when you press on the dot from both sides of your nose. If you would like you may add two more important points that are also located on the eyebrows.